Whom to select for the list of 21-22 persons to be charged? Well, whom did the allies have in custody? Not all those they desired. They had Reichsmarschall Herman Göring who headed the air force. 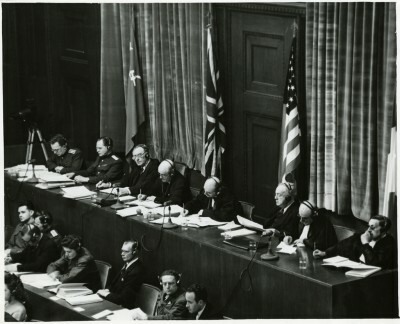 Whatever the valid charges against Göring, they were not considered to be mitigated by the fact that under Göring the German air force was mainly used against enemy formations on the battleground and not, like the US and British air forces in situation terror bombing of civilian cities, such as Dresden, Tokyo, Hiroshima, and Nagasaki, or by the fact that in Hitler’s final days Hitler removed Göring from all his positions, expelled him from the party, and ordered his arrest. They had foreign minister Ribbentrop. They had field marshalls Keitel and Jodl and the grand-admirals Raeder and Dönitz. They had a German banker, who was saved from sentencing by the intervention of the Bank of England. They had a journalist. They had Rudolf Hess who had been in a British prison since 1941 when he went to Britain on a peace mission to end the war. They wanted an industrialist, but Krupp was too old and ill. He was devoid of the persona of a foreboding evil. You can read the list in Irving’s book. Zionists have branded Irving a “holocause denier,” and he was convicted of something like that by an Austrian court and spent 14 months in prison before the conviction was thrown out by a higher court.